How To Deal With The Lost Baggage at The Airport? Losing your baggage at an airport could be the worst nightmare of any traveler. There are probably various reasons due to which you can find yourself in such a situation. Yes, it is a dreadful experience and probably hundred of passengers face this problem every single day. Well, there are a number of restrictions attached to the checking in and out of baggage and proper security is also given importance but still, things like lost baggage, stolen baggage, damaged baggage, delayed baggage are very common at every airport. It may happen to anyone so it’s better if you know what to do in such a case! This is probably the basic mistake that everyone does. No matter how tired you are, be there at the airport and don’t go home. If you think you can deal with this the next day, then trust me it would be too late for that. Report for the lost or stolen baggage as soon as possible as it will only help you to get your luggage back. Most confusion takes place when you need to catch the connecting flight as you are already in hurry, hence situations like these can very easily take place. The majority of the times it happens when the timings of your baggage and the next flight does not match. Once your baggage is lost, there is no benefit of yelling or screaming at the employees of the airport. Keep yourself cool and patiently talk to the officials and remember that they are not the one who is responsible for your lost baggage. They are only there to file your complaint. You should fully aware of the airline’s cutoff time regarding checking of luggage. A 5 to 10 minutes of delay can really put you in a tight situation. So reaching before the time limits can prove helpful to you only. As soon as you find it that your baggage has been stolen or lost, the next step to be taken is to file your complaint and the airport’s baggage service desk may be the best option to do that. It would be totally useless to think that you will get a full claim of the lost or stolen luggage of yours. Just make this thing clear in your mind as soon as possible. In case you try to exaggerate or lie about your lost stuff, the officials will ask you to show the receipt of your each carry-on. So unless puzzling in that give a correct description of your lost things. If you don’t get your luggage on the same day, do remain in touch with the airline’s officials and always remember all the information required for the process of searching for the date and flight numbers. Some of the credit cards offer you flight insurance and especially related to your baggage coverage; when you buy a ticket with that card. And some homeowner’s insurances also cover these losses, so check out these things too.  What not to say? Never say that you have valuable things in your bag or you don’t know that what is inside your bag. Just give an itemized list of what was in your luggage. The better description you can give regarding your things like the size, color, and quantity; the better are the chances of its finding. • You can claim for the fee that you pay for your checked baggage. • If you lost your sports equipment, then you can get the claim for that from the airlines itself. • If your luggage is really lost and there is no chance of getting it back, then, in that case, the airlines have to reimburse you for it. All you need to do is to fill a claim form explaining the details of the stuff in the bag. • If your luggage is delayed and you want it back, don’t think that you will get it for free. Uncertainties like baggage lost or stolen can take place anytime to anyone. It up to you to remain active and alert and knows your rights regarding your claims and reimbursement. Posted on March 25, 2017 March 25, 2017 Categories Travel TipsLeave a comment on How To Deal With The Lost Baggage at The Airport? Nowadays, the majority of the people find air travel the easiest and the most convenient mode of transportation. And when it comes to the senior category, things are little different and tricky in terms of traveling through the air. Undoubtedly, the number of older people is increasing rapidly from the past recent years and so as it has increased the importance of making good efforts to make their traveling experience more comfortable. Financial Problems: Senior citizens are non-earners; hence it becomes quite difficult for them to purchase certain tickets. Lack of knowledge: People above 65years of age are not aware of how to use the internet and if they do know, then probably they don’t have enough knowledge regarding specific deals which could increase their benefits. 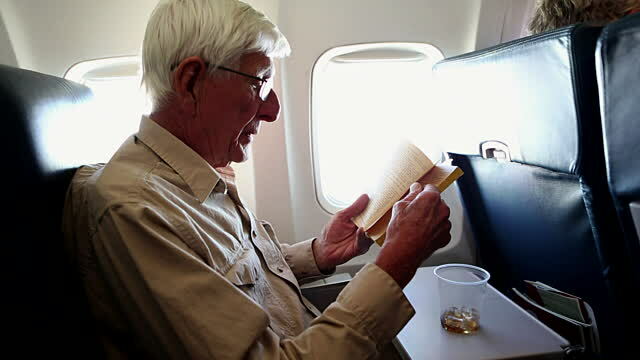 Health Issues: The older people are more likely to be having serious health issues or infection problems; hence it is also counted as one of the issues regarding traveling through the air. Luggage Problems: It becomes very difficult to handle huge baggage by the normal person, so imagine how harder it would be for the elders to deal with this stuff. Age never matters when it comes to traveling different spots but the complications which the elderly people face should be are a bit more. Either they are going on a vacation or just to meet their family members, extra care and benefits can help them to reduce the effect of a long journey. To tackle the above-discussed problems, we gather a list of few tips and tricks which help in making the traveling experience of these seniors a little more convenient. Senior citizens are very easily affected by the inappropriate ambiance, so if you have any health issue or infection, do traveling with all your MEDs with you. If you want to get an appropriate deal which ensures maximum gains, then it’s better to book your ticket online and if you can’t do so do take the help of a family member to help with reservations. Booking a direct or non-stop flight would be the best option to click in case of older people in order to avoid any further discomfort ability. Do search for senior discounts because most of the flights give special benefits to the senior people, so study all the alternatives in hand. It is obviously more convenient to travel which lead your arrival and departure during the day timing especially in the case of elderly people. Nothing is more helpful than the family, so it’s better if one of the family member or relative is with the senior people while traveling. If you have any issue regarding walking from one terminal to another in the airport, then do a request for a wheelchair from the airport. American Airlines: The authorities of American airlines have made an extra effort by ensuring them benefits like wheelchair assistance, facility to travel with a portable oxygen concentrator, availability of extra seat for the personal attendant and much more. United Airlines: United Airlines offers special fares to selected travel destinations for the passengers who are 65 or more. Along with that, they also provide special tips to them regarding their traveling. Delta: These airlines have also made a special column for kids, seniors and other individuals with disability along with the ones who want to bring their pet along the ride. It seems good when an airline does some extra effort for the comfort of their passengers. US Airways: US Airways has also made an effort by giving special attention in case of disabling and immoveable persons. SouthWest Airlines: These airlines have also make specifications regarding fares, limitations, and restrictions. They promote for a fully refundable amount for seniors in case of ticket cancellation. Air India: Air India has also made a unique move by offering discounts to senior citizens over 60 in all domestic and international flights to the US and Europe. So choose wisely and pick the most effective offer. Don’t look too hard on the discounted deals, just avail the one through which can make your traveling experience comfortable and the one you can easily avail through flydealfare. It’s not a big deal for a senior citizen to travel alone; all you need to do is proper planning and selecting the right option.